Betsy-Tacy and Tib! was posted on September 4th, 2015 at 9.13am and is filed under Audiobooks, Blog. This entry has 6 comments. You can follow any responses through the RSS 2.0 Feed. 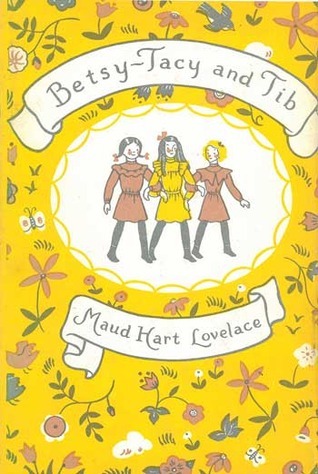 Betsy-Tacy and Tib: the second book in the Betsy-Tacy series by Maud Hart Lovelace. The series is based on the author’s life; her family and friends have been renamed, but they really were just like the the people in the books! In this book, Betsy, Tacy, and Tib, who are now eight years old, play just as well together as Betsy and Tacy did, and they never quarrel. They get into a little more trouble in this book, though! I’m going to post the whole book here all at once; the chapters will be in my podcast feed three times a week, as usual, but I don’t feel like scheduling individual posts here to match. Thank you for reading us another wonderful book! I love the Betsy Tacy series, would you read us more of the series? Awesome, as far as working on the whole series. I’m reading Betsy-Tacy right now. Awesome reading, as usual. My girls are just loving your Betsy-Tacy recordings. Looking forward to book 3 when you finish it! Thank you! Yay, we’re looking forward to the next one too! Thanks Kay Ray! Thank you so much for doing this! My 2.5 year old daughter loved listening to her Betsy and Tacy audio book over and over, and I just discovered your reading of the next book in the series today. She is already on her 2nd listening of this one. Thank you for all your hard work. :) I am bookmarking your site and readings. Thank you again!! !